It was a strange sight that definitely turned heads. 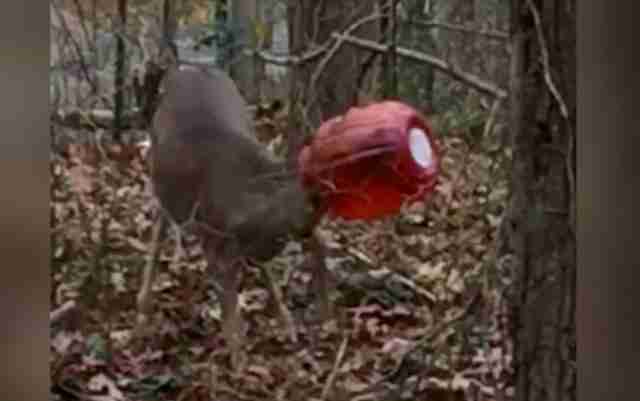 Around Rocky Point, Long Island, this week, residents began seeing a deer who had gotten her head stuck in a large plastic container — making her unable to eat or drink. 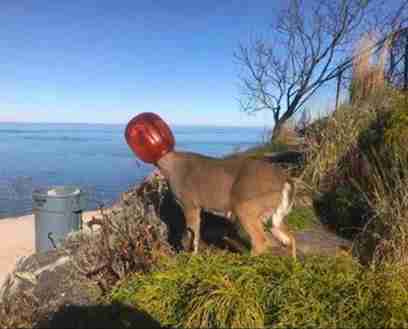 The orange-tinted jar was also clouding her vision, and as the days went on, the deer kept getting weaker. The local community kept watch for her to appear in their yards, but while many people spotted her they were unable to keep track of the shy animal before she disappeared again. Strong Island Animal Rescue League shared her photo on social media, hoping the deer would settle into someone’s yard so they could step in to help her. 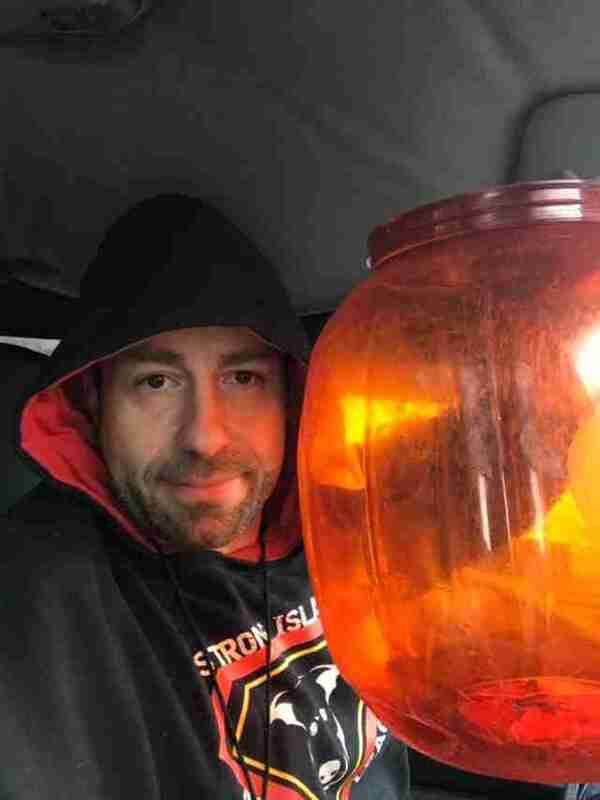 The group knew she had to be hungry — and that the jar would eventually become a death sentence for the animal if they couldn’t help her in time. Luckily, their online pleas worked. 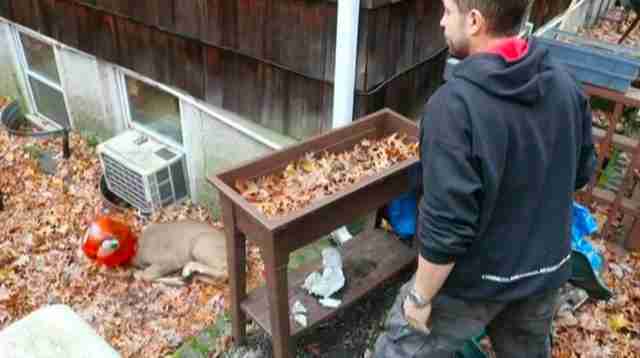 After evading rescue for five days, the doe wandered into a yard and settled down in a pile of leaves. The homeowner noticed her and contacted the rescue team right away. The deer looked very tired, but she still tried to flee as rescuers approached her with a catch pole. Rescue president Frankie Floridia leapt into action, wrapping his arms around the frazzled doe and placing her back down on the ground. He managed to quickly pull the container off of the animal’s head before she made a run for it out of the yard. Thanks to Floridia’s quick thinking, the deer was finally safe. She’s expected to be just fine on her own in the wild now that she can eat and drink. Floridia, on the other hand, has a split lip and scraped knee from the encounter — but it was all worth it, he said. This deer was lucky to be saved, but so many other animals who get trapped in garbage unfortunately don’t get help in time. Litter can often be deadly for wildlife who put their heads inside discarded jars or cans while looking for food. Luckily, there’s a very simple solution. To help more animals in need, you can make a donation to Strong Island Animal Rescue League.